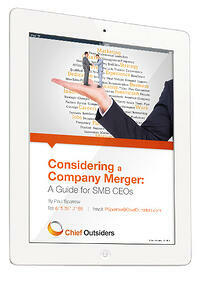 Download Paul Sparrow’s eBook, “Considering a Company Merger: A Guide for SMB CEOs,” to help you determine if a merger or acquisition can keep your small to mid-sized business from losing ground. In today’s hyper-competitive, global marketplace, many CEOs feel like they’re in constant battle mode, rousing R&D to develop innovations as a means of fortifying their company’s defenses against the competition. M&A is an often dismissed, yet viable option for some small to mid-sized companies that find themselves struggling to maintain market territory. In this eBook, we will help you decide if a merger is an option for your small to mid-sized business, what type of merger could work best, and how to navigate the entire M&A process from the CEO’s chair. Feel free to email Paul directly at PSparrow@ChiefOutsiders.com if you have any questions or want additional information.